Customer journey mapping is the act of graphically portraying your customer’s experiences with your organization across major and minor touch points (times when your customer interacts with your organization or product). Journey mapping is a holistic approach to understanding the flow of experiences a customer has with an organization ; it uses pictures to represent a process that cannot be adequately captured with words. If you are familiar with customer journey mapping, then you know that it can be incredibly complex. However, journey mapping is a useful activity, even when it is not perfect or sophisticated. Some disciplines (like heart surgery) should not be attempted without formal training, but customer journey mapping is more like entrepreneurship: While you can get a formal business coach to assist you, you can also dive in and learn by doing. Used in the right circumstances, either method can be effective. The more you explore journey mapping, the more you will learn its mechanics, and the better you will understand what your customer is experiencing with your organization. 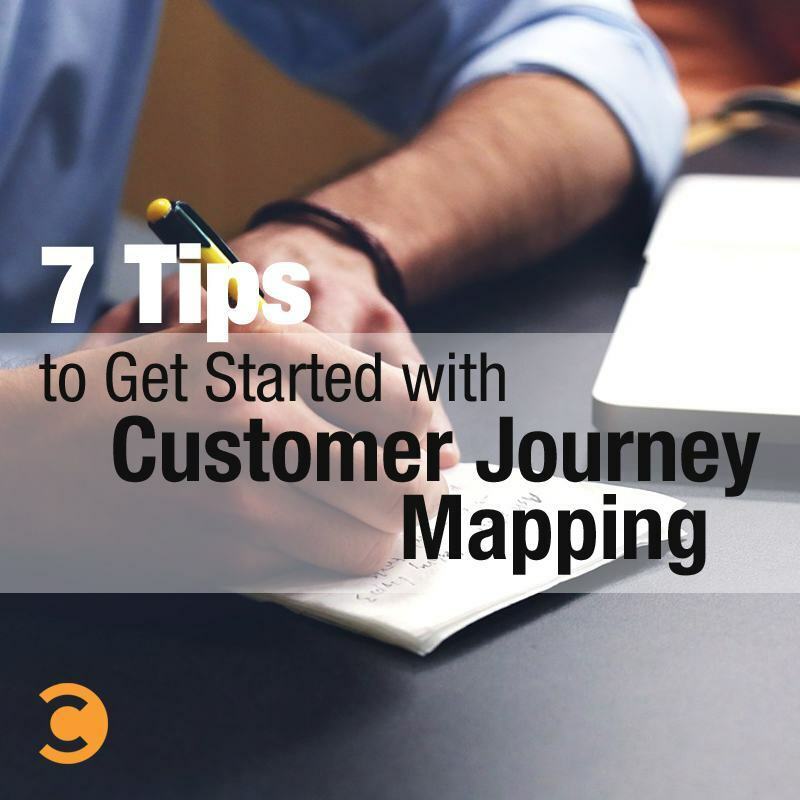 Let’s jump right in with seven tips to help you get started with customer journey mapping. The most foundational step in customer journey mapping is identifying the touch points where your customer interacts with your organization. Look for both major and minor touch points. In the car buying process, for instance, major touch points might be taking a test drive or sitting down at the salesperson’s desk to negotiate the final deal. Minor touch points might be when the customer walks around the lot prior to being greeted by a salesperson or when the customer is delivered their car after the sale is complete. You want your map to cover the entire journey from marketing to post-sale follow up surveys. Any distinct point where the customer interacts with the organization should be mapped. Often, a specific touch point has multiple paths of entry. Did the customer enter the purchase process through the website or toll-free number? Did organic search or your display ad campaign bring the customer to the toll-free number? Once the customer was on the phone, were they routed to the technical support or billing departments? Questions like these can complicate customer journey maps extremely quickly. Look at the simple graphic below, which shows the purchase of a gumball from a gumball machine. It’s a simple process, until the machine jams. Now, we have to entertain three different scenarios that occur after the jam: 1) the customer walks away without dealing with it, 2) the customer gets a refund from the cashier, or 3) the customer’s kid really wants a gumball, so the manager has to come open the machine. When evaluating a touch point, it is important to look at the touch point through the lens of onstage (what is visible to the customer) and offstage (what goes on behind the scenes). For instance, in the car buying example, talking to the salesperson would be an action that occurs onstage. Running the credit check for financing would usually occur offstage. Make sure you understand how offstage actions, like internal communication, impact the onstage experience. Often in journey maps, offstage actions are drawn differently or placed below a “line of visibility.” No matter how you denote them, it is helpful to distinguish offstage actions from those that are customer-facing, so you can separate the customer’s actual experience from the operations that support it. Every touch point is important. Let me repeat that: Every touch point is important. However, some are more significant to customers than others. I like to view these touch points as pressure points—those moments of truth that truly impact the customer experience. As noted in the car purchase example above, the test drive and the sale sit-down are two particularly important parts of the car purchase journey. These are the parts where sales are made, opinions are heavily influenced, and things can fall apart easily. Of course, the minor touch points we mentioned matter. Both how clean the parking lot is and the last moment when a car is handed over should be evaluated for maximum effectiveness. However, you should always take an 80/20 approach and focus on the pressure points that impact the customer experience the most first. To truly understand what happens at each touch point, you have to get feedback from as many stakeholders as possible. Then, you can use that information to add a qualitative layer to the journey map. In other words, don’t just map what happens, map how you are executing your service delivery. Let’s go back to sitting at the desk negotiating a car purchase. Is the salesperson too pushy? Is the process too long? Are the chairs uncomfortable? Use survey data or mine your complaint data to find out what is happening at each touch point. Do a Google search for “customer journey maps.” Like the screenshot below, you will find journey maps in a variety of configurations and colors. Do not waste valuable energy worrying about the correct form, because it doesn’t exist. (In fact, customer journey mapping is not even the only name used for this process. Two others are service blueprinting and customer experience mapping.) Spend your time focused on identifying touch points and how they connect; eventually, you will find the form that is right for you. While the mere exercise of mapping your customer’s journey has value, the ultimate goal is to improve your customer’s experience by understanding what they go through at each touch point and improving the quality of that experience. Using the 80/20 approach, start with your most important touch points, and ask one question: how can I make this quicker and easier? Can I remove parts of the process to make it go quicker? Can I empower employees to make the process easier by solving more issues in real time? Of course, there is much more to a quality customer interaction than just timeliness and easiness, but they are great places to start. While customer journey mapping is infinitely more complex than the seven foundational tips listed above, the simple act of getting started with journey mapping will provide you tremendous, actionable insights into your customers’ experiences with your organization. Just remember that a customer journey of a thousand miles begins with a single step. Adam Toporek is the author of Be Your Customer's Hero: Real-World Tips & Techniques for the Service Front Lines (2015), as well as the founder of the popular Customers That Stick blog and co-host of the Crack the Customer Code podcast.